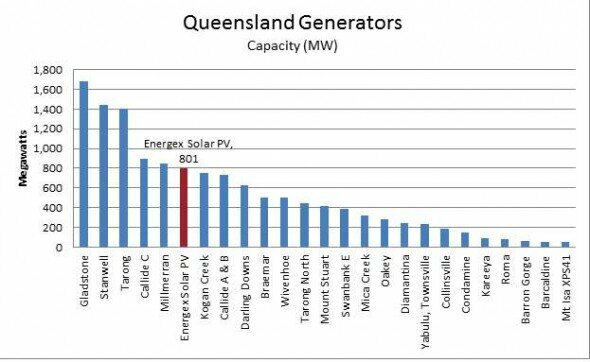 The combined capacity of rooftop solar arrays in south-east Queensland, the area managed by the energy distributor Energex, has now surpassed 800MW, making it the sixth biggest generator in the state. New data prepared by Energex underlines how solar continues to be attractive to Queenslanders, even without the huge feed in tariffs that were ended just over 18 months ago. In the month of March, more than 4,000 new applications were received, and 3,250 rooftop arrays were officially metered. This means that now more than 250,000 homes have rooftop solar – and together supply 11 per cent of total residential power in that area of the state – and nearly one in 5 of these homes are on the lower 8c/kWh tariff. This is bringing down the average FiT from 44c kwh to 37.5c/kWh. That figure will fall as homes and sold and lose their premium tariff, and more arrays are added at the cheaper tariff. In turn, that makes rooftop solar in the south-east corridor managed by Energex the sixth biggest power station in the state, as this graph below reveals. More than 11 per cent of total residential power consumption in the area is now sourced from embedded generation – namely rooftop solar. Of the 251,972 solar installations in the Energex region as at the end of March, more than 250,500 are on domestic premises, although the interest in commercial solar is growing. There are no utility-scale solar installations in the state.